A new insight into cancer stem cell markers: Could local and circulating cancer stem cell markers correlate in colorectal cancer? Cancer stem cell (CSC) markers could serve as potential prognostic procedure. 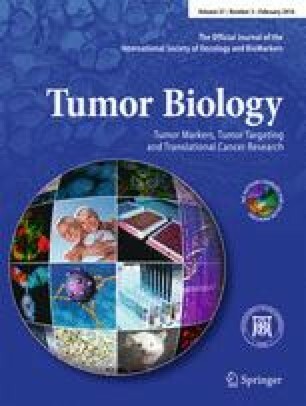 This study is aimed to investigate the local expression of doublecortin-like kinase 1 (DCLK1) and Lgr5 in colorectal cancer tissues (CRC) at both protein and messenger RNA (mRNA) level, followed by providing a comparison of the local and circulating expression pattern of these markers, based on our present and previous study. The mRNA expression level of DCLK1 and Lgr5 was evaluated using comparative real-time PCR method applying 58 fresh tumor tissues and their correspondent normal margins. Immunohistochemistry was applied to analyze the protein expression level of DCLK1 and Lgr5 in paraffin-embedded CRC tissues. The correlation of DCLK1 and Lgr5 expression pattern with clinicopathological characteristics was assessed. A higher mRNA expression level of DCLK1 (3.28-fold change, p < 0.001) and Lgr5 (2.29-fold change, p < 0.001) was observed in CRC fresh tissues compared to the normal adjacent margins, and the expression level was higher in patients with higher grade and stages of disease and patients who underwent neoadjuvant chemoradiotherapy (CRT). The protein expression level of DCLK1 and Lgr5 was also increased significantly in tumor tissues compared to normal colon tissues which were positively correlated to tumor stage and grade and neoadjuvant CRT. Taken together, the results of protein analysis were in accordance with mRNA assessment. The local expression pattern of DCLK1 and Lgr5 was also in accordance with their expression level in circulation. However, some minor inconsistencies were observed which may be attributed to several factors including the possible effect of CRT on CSC reprogramming. Hamilton G, Olszewski U. Chemotherapy-induced enrichment of cancer stem cells in lung cancer. Journal of Bioanalysis & Biomedicine. 2013; doi: 10.4172/1948-593X.S9-003.